Q. Obviously it was a very tough day for you today. Can you say why? RAFAEL NADAL: No, was a normal hard tennis match. That's what happened, no? I was playing against a very good player and I won 6 4 in the third having a tough match. That's the normal thing when you are playing the quarterfinals of a Masters 1000. The not normal thing is go and win 6 2, 6 2. That's not working. Q. Do you think Dimitrov has the potential to get to the top 10 soon? RAFAEL NADAL: Why not? I always had that feeling. Always depends on how he stays mentally, how he's able to keep working hard and improving. But, sure, he's a great player and he has all the shots. He has everything to be a really, really good player. So depends on him. Q. If you were his coach, what would be your remarks about his game? RAFAEL NADAL: Oh, I think he has the right people around him probably. I am nobody to take an advice to the rest. I think he's enough good. Only thing is keep working, keep improving. That's the only thing that is important when you are young and when you are going up. Q. You made more unforced errors than usual. For any reason? 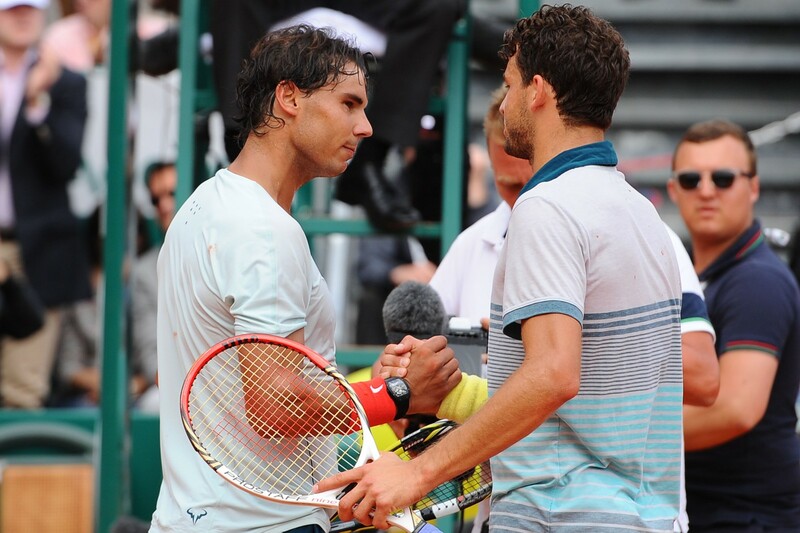 RAFAEL NADAL: I played a great first set. I had a fantastic first set, so that's very important. That means that my level is there, so I can play that level. I didn't play tennis for seven months. That's what happening. I am losing little bit intensity of the match for moments. That's something that can be normal after being a lot of time outside of the competition. I played for a month, now I stop for another month. So I need time. I think I need time to play with top rhythm all the match, no? I think I was playing great at the first set. I felt that I was playing my best level. So that's the most important thing. I take that on the match. Q. But maybe tomorrow you have to play two good sets to beat Tsonga. RAFAEL NADAL: If not I go back home. I go back to Barcelona, that's it. That's sport. That's the end. That's the game: you can win, you can lose. If I'm able to play as I play at the first set, I'm going to have my chance, sure. If not, I going to be in a problem. That's the thing of sport. I hope to be ready to compete well tomorrow another time. I will see. Q. You say maybe you're missing a bit of intensity. You still have your fighting qualities. RAFAEL NADAL: It's important play, you know, with all that you can. Some days I play great first set, then I play so so. So is very important win these kind of matches. That change your year. I know that. I have experience on that. I always did well these kind of things. For that reason I was able to be very regular during whole my career, no? I know that when you have these tough matches, is decisive to keep fighting. If you keep fighting, you will lose some ones, but you will have a chance to win a lot of ones, too. I gave that fight. Finally he had his chance, and I had my one, and I converted. That's it. I think I played better the last couple of games. Obviously I'm trying to find better rhythm all the time. In my opinion, I did it in the end. It was great. Q. You had some tape on your back. Any issue there? RAFAEL NADAL: Yes. Okay, I don't want to talk about that injury, because then you know what happen when I say something? The only thing you going to write is that. I happy to be in the semifinals. I am playing best with what I have today. Is normal have problems. Is normal have problems on the back, on the shoulder, on the elbow. You know, I didn't play tennis for seven months. Is not like if you stop and you have the chance to practice. I didn't practice. I practiced two weeks, then I started to play tournaments. Then I stopped for the month. I didn't play tennis for two weeks because I had to do treatment on my knee another time. I passed one week before here and I'm here. So the body in general needs, I don't know, to adapt another time, readapt to the competition, to this high level of intensity and will bring the body to the limit. To make that happen and feel well, you need to be more with that than I am today. Q. Can you talk about how nervous or tense you were 4 All in the third set? RAFAEL NADAL: I was nervous, but normal. Nothing really special at the end. We are in quarterfinals. We're not playing for win title yet, so... That's sport. When you are playing and when you go on court, you know that you will be in these situations. I have been in these situations a lot of times. Sure I am nervous. I am not an exception. Everyone is nervous when you are in that situations. But try to accept, try to accept that the opponent was playing well, try to find solutions to win. So finally I was lucky. I am through. I find the solution at the right time. So happy for that. Q. What will you need to do to beat Tsonga tomorrow? RAFAEL NADAL: I need to play well. That's all what I need, play well and wait that opponent don't have his, you know, big inspiration tomorrow. That's always the same. When I play against the best players of the world, only thing I am thinking is try to play my best and hope my opponent doesn't have his best day. Q. The only time you played Tsonga on clay, you beat him easily. Is it an advantage or not? RAFAEL NADAL: That happened in the semifinals of Davis Cup 2011. No, we'll see. At the end, it's not like I was beating him eight times in a row. Is different. I only beat him one time. He played well. He played a great Davis Cup, a good few matches there. He's playing great here. Today he had, in my opinion, a fantastic victory, win against Wawrinka here on clay. Fantastic victory for Jo because Wawrinka is a very dangerous and complete player. He came to this match playing very well. So is a great victory for him. That's a lot of confidence for him, too. We'll see. I have to play aggressive. I have to play my game. If I am playing at the level I played the first set, I really hope that I will have chances. Q. There were people who say that Dimitrov has the style of Federer. What do you think? People are thinking there will be another rivalry. 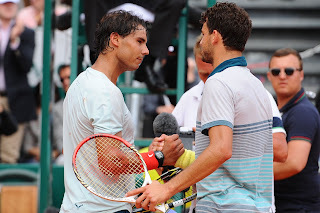 RAFAEL NADAL: I don't know if I will be there for that one (laughter). We need to find a new Nadal. I think he has a similar style. Everybody can see that. How old is Dimitrov, I don't know? RAFAEL NADAL: He's still young, I think. I don't know. Something strange is happening on the tennis that the players start to play well later than before. That's my feeling. So when Federer started to play very well much younger, I did much younger, Hewitt did much younger, Djokovic too, Andy too. Something a little bit is changing. I don't know why. We have to analyze why. But he has time. He has time to have a great career. If he start to be in the top, he start to give him chances to win big tournaments before, better for him because at the end, if not, the tennis is not forever. It's not like golf, you have 20 or 25 years of career. Here our sport is more aggressive for the body, so we don't have that lucky. He still have time and he is doing very well. I saw him play very well in Indian Wells and Miami. He did well here.